We have this generator available from our yard immediately for collection or delivery anywhere in UK / outside UK to EU / worldwide. 1 owner from new only. 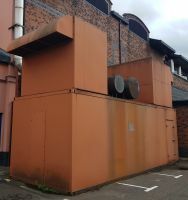 Built by FG wilson in 2000 for major TV company and used as a standby generator only, powered up every few weeks to ensure was kept in top condition and maintained and serviced regardless of cost. Generator has egcp-1 engine control system included for full generator control, start etc.. This can be viewed anytime and is ready to ship immediately. Payment by cleared funds before collection / delivery.